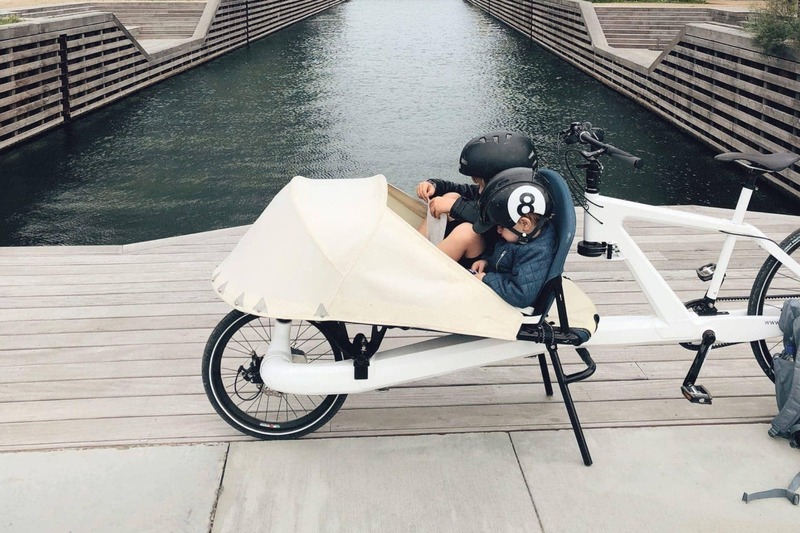 Anna – a true family "Sled"
Reinterpreting the two-wheeled cargo bike, our Velosled has a lot of room for transporting adults as well as children not to mention the groceries or any other cargo. Manufactured with a full carbon frame this bike offers a robust, stiff and lightweight ride. VeloSled has wishbone suspension, adjustable steering angles, 200 kilo capacity, the option for adding an electric motor, and not the least a long lasting and maintainable design that can go on for decades. She is built using an unusually strong and tough carbon fiber technology making it maintenance free, repairable and fantastically light. We call this model ‘Anna’. Her design is inspired by the Inuit “qamutit” dog sleds that have been used in Greenland as family and expedition transport for centuries. ‘Anna’ has been brought into the world to provide efficient and enjoyable transportation for the entire family. Would you like to be riding a VeloSled? We now offer pre-order of VeloSleds here on the website. Bikes will be ready for delivery in June/July and we will of course be updating about the progress of production of the first series. In the very near future we will be ready with our rear hub electric solution. Please contact us directly if you are interested and we will make sure to add you to our waiting list. Prices for the VeloSled are starting at €3800. VeloSled will evolve with your needs and your lifestyle. 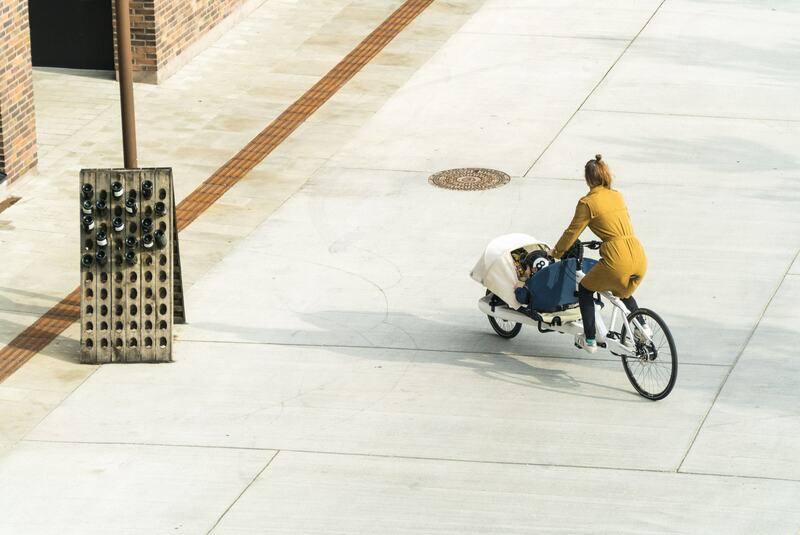 Be it with kids or no kids, city riding and shopping errands or just moving stuff around town. 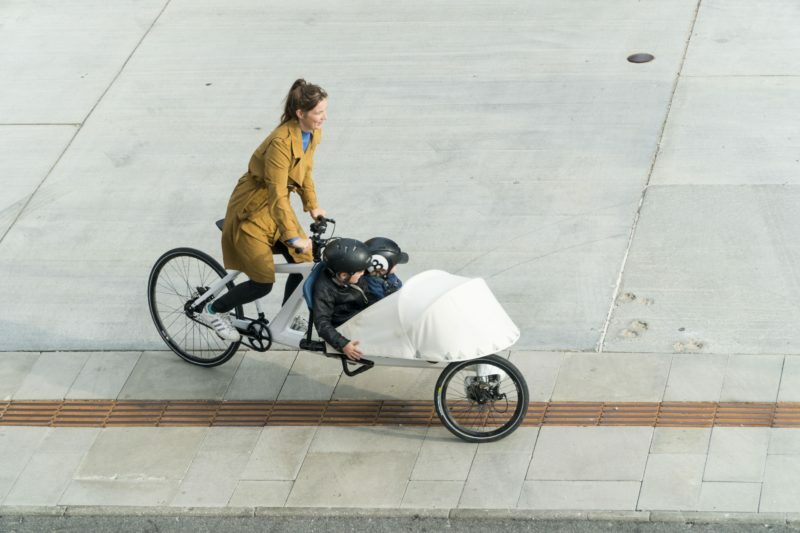 VeloSled is a great ride for the everyday jaunt and a flexible companion for individuals and families. Our rear hub driven, electric motor solution can be fitted to any sled, so that when the kids are old enough to ride by themselves, your sled can become yours again and be on stand by as the ”family wagon”. 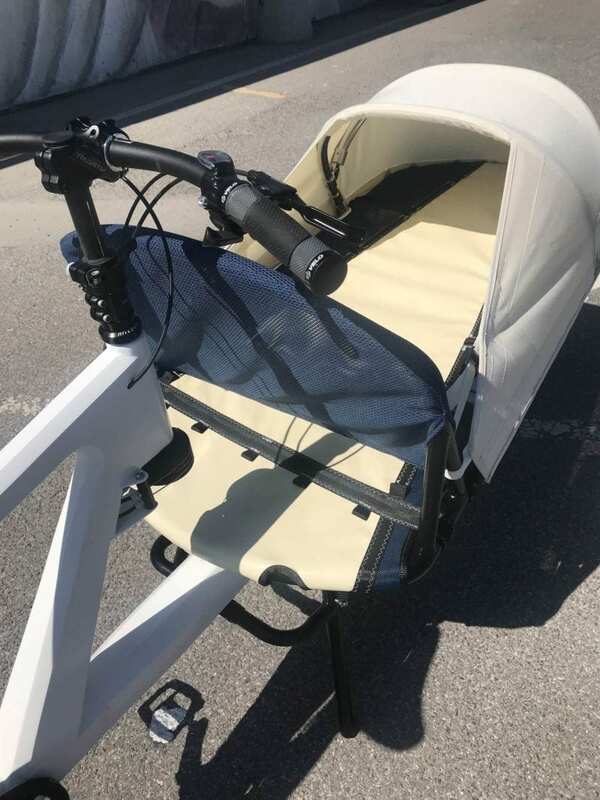 The VeloSled is designed to be modular so that the motor option can be swopped on or off throughout its life and the rack combination and accessories can be added or removed as needed. 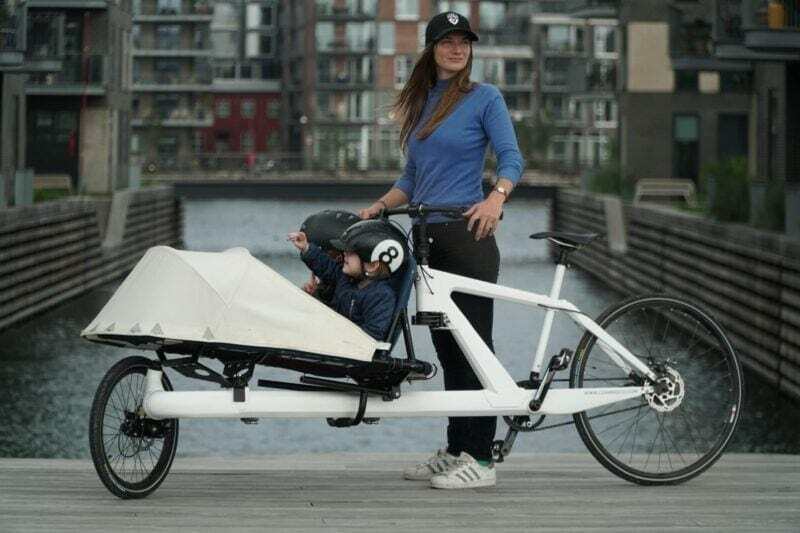 Two wheeled cargo bikes are long and can carry a lot of weight. This means that they present unusual challenges when it comes to dealing with frame twist. We chose carbon because it is several times stiffer than aluminium and much better at withstanding fatigue than most other man made material. Additionally carbon does not corrode which makes it well suited for the task at hand. Contrary to its reputation carbon is also phenomenally tough and quite repairable. We have designed our laminate with maintainability and reparability in mind should it ever be damaged. Innovative use of materials makes Anna the toughest ride on the road. The strength and lightness of carbon together with a slick two-wheeled design, gives a smooth ride, while keeping your bike stiff and agile even when its fully loaded. Responsive cable steering makes sure you always have a safe and comfortable ride. A carefully selected brake system combined with the smooth steering capabilities gives you full control, ensuring a smooth ride even with a heavy load of cargo. Anna will accept pretty much any type of cargo. The stiffness of the frame makes sure that even heavy loads won’t make her shiver. The front rack is flexible and prepared for various accessories to fit your needs, be it transporting tools, parcels or lunch for your employees. Electric bicycles are helping more riders buck headwinds than ever before. Anna utilises a hub mounted motor which ensures that the weight of the motor is giro stabilised by the wheel itself – and it reduces wear and tear on the drive train. More importantly it allows the bicycle to be updated, converted and maintained as needed without regard to the frame. We will have multiple hub drive options available to fit the needs and pockets of almost any rider. Annas seat tube can be adjusted forward and backwards as well as up and down, making her comfortable for riders large and small. Her handlebars can also be adjusted up and down for different riding styles. Everyday riding puts a strain on any bike. An option of the oil free Gates carbon belt drive makes Anna easy to maintain, more powerful and provides a silent ride.